Overall, catfish are some of the most abundant species of fish in the world. According to Practical Fishkeeping, there are now over 3,000 species of catfish around the world. Depending on the species, catfish can range in size from 1.5 to 2 inches (4 to 5 cm) to hundreds of pounds, like the behemoths on this list. 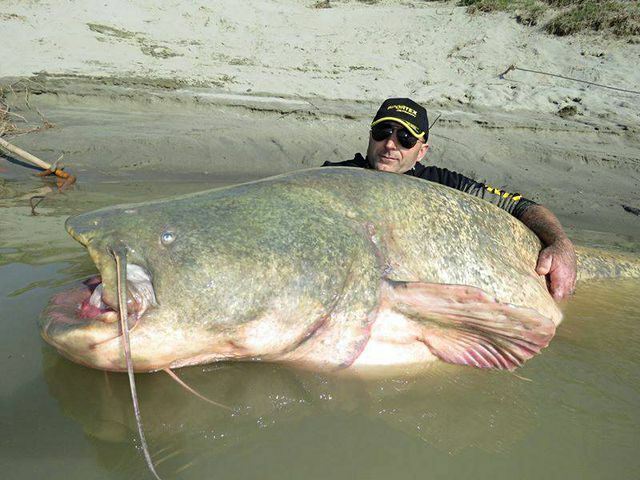 All of the catfish on this list are over 100 pounds (45.36 kilograms). Nearly all of these catfish are listed as the world record for their species in the International Game Fish Association’s (IGFA) World Records Database. As of the time of this writing the records are accurate. The record for the largest flathead catfish belongs to Ken Paulie, who landed his big flathead over 20 years ago. Paulie’s flathead catfish weighed 123 pounds (55.79 kilograms) and was over 5 feet (1.55 meters) in length. While Paulie’s record was verified by the the Kansas Department of Wildlife and Parks and has been standing for over 20 years, many people have questioned the legitimacy of Paulie’s catch. Paulie was using a light tackle while he was crappie fishing and the flathead was a lucky catch. Paulie’s flathead catfish was frozen for many years before it was presented to the Kansas Department of Wildlife, Parks, and Tourism in 2016 for further examination. Researchers determined that the record flathead catfish was at least 22 years old, grew very rapidly, and was most likely a male. 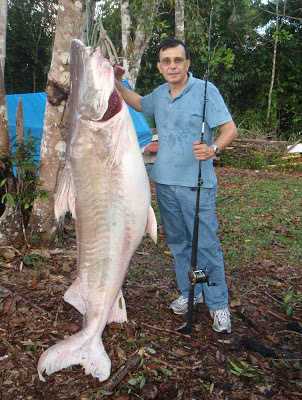 The world’s largest redtail catfish was captured in 2010 by Gilberto Fernandes in Brazil’s Amazon River. Fernandes’ redtail catfish was 123 pounds 7 ounces (56 kilograms) and 4.62 feet (1.408 meters) long. There really isn’t any more details about Fernandes’ catch, but he did use a fiberglass Sportex rod to land the redtail catfish. According to a news report, Fernandes has over 100 IGFA world fishing records. 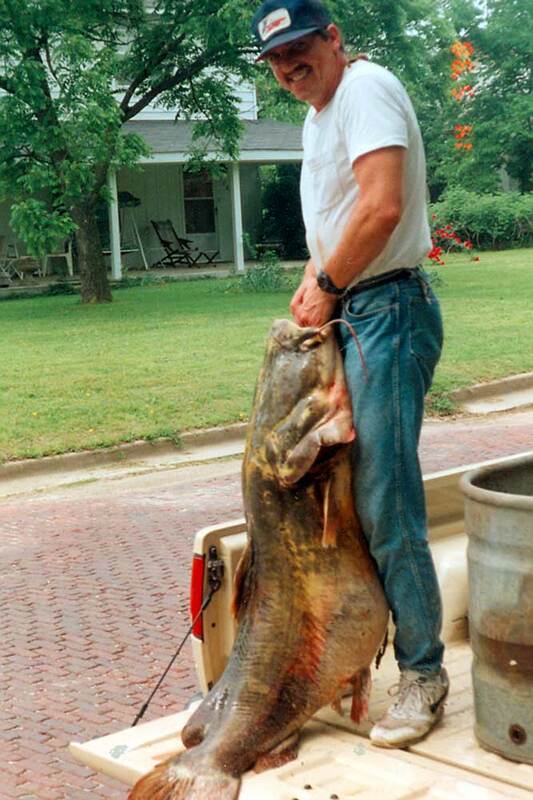 Just a month before he made his record redtail catfish catch, Fernandes caught another redtail that was 113 pounds 8 ounces (51.5 kilograms). Redtail catfish are not picky eaters and in the wild tend to eat fish and crustaceans. In captivity, redtail catfish eat assorted worms, frozen foods, sinking catfish pellets, and dry foods. 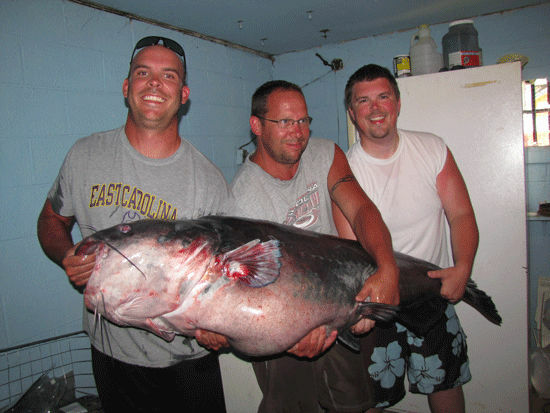 The record blue catfish was caught in 2011 in Kerr Lake, Virginia by a man named Richard Nicholas Anderson. This large blue catfish weighed in at 143 pounds (64.86 kilograms) and was 4.75 feet (1.45 meters) long. It took Anderson about 45 minutes to land the giant blue catfish, whose size surprised Virginia Department of Game and Inland Fisheries chief Gary Martel. Anderson wanted to keep his blue catfish alive so that it could be put in a tank at a local Bass Pro Shops retail store. However, despite his best efforts, his record blue catfish died. Blue catfish were intentionally introduced into rivers in Virginia in the 1970s, but have now become an invasive species that grows and breeds rapidly. The record for the largest Goonch ever caught belongs to Jakub Vágner, the host of National Geographic's “Fish Warrior.” Vágner's Goonch was 165 pounds 5 ounces (75 kilograms) and over 5 feet (1.57 meters) long. The Goonch was caught in the River Ramganga in India. In addition to the large Goonch, Vágner has caught several other large freshwater fish, including and 286.6 pound (130 kilogram) Arapaima and an 242.5 pound (110 kilogram) Wels catfish. 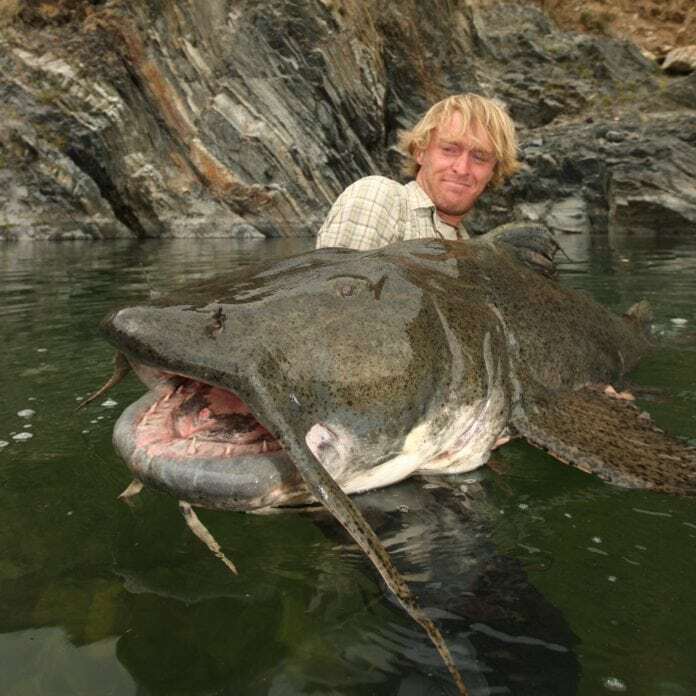 In an interview, Vágner said that he is sill after the world record Goliath Tiger Fish of the Kongo river. Goonch catfish have reportedly been known to eat corpses from funeral pyres on the Kali River, which runs between Nepal and India. It is speculated that this has allowed the Goonch to grow so large and develop a taste for human flesh. In 2015, an Italian fisherman named Dino Ferrari was featured in international news for capturing a monster Wels catfish in the Po Delta. Ferrari's Wels catfish weighed 280 pounds (127 kilograms) and was 8.75 feet (2.67 meters) long. Although Ferrari's catch is impressive, unfortunately he was just shy of the world record for a Wels catfish catch, which weighed 297 pounds 9 ounces (134.97 kilograms). However, other than the official record listing on the International Game Fish Association's website, there wasn't enough information to feature the story of the record Wels catfish. Ferrari's sponsor did say that his catch may hold the world record for a fish caught with a Torpedo spinning rod made by an Italian manufacturer. It took Ferrari 40 minutes to catch the Wels catfish and he decided to release the fish back into the water so he could be caught again in the future. 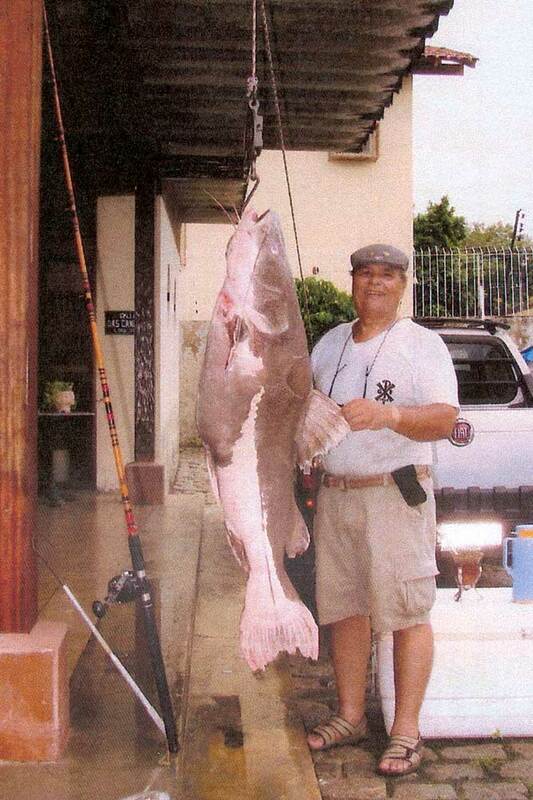 Jorge Masullo de Aguiar currently holds the world record for the largest Lau-Lau (Piraiba), which is a species of catfish that is native to South America. Masullo de Aguiar's Piraiba was caught in 2009 and weighed 341 pounds 11 ounces (155 kilograms). This giant South American catfish was also over 6.5 feet (2 meters) long. While Masullo de Aguiar's Piraiba is the largest officially on record, in general, Piraiba can weigh over 450 pounds (204 kilograms). In fact, the Piraiba is the largest of the catfish species found in the Amazon. Piraiba are so large that monkeys, cats, dogs, birds, and other catfish have been found in their stomachs. In 2005, a behemoth Mekong giant catfish, weighing in at a scale-tipping 646 pounds (293 kilograms) was caught in a remote village in Thailand near the Mekong River. Experts believe that this monster Mekong giant catfish is not only the largest catfish ever caught in the world, but the largest freshwater fish ever recorded. In addition to weighing nearly 650 pounds, this Mekong giant catfish was 9 feet (2.7 meters) long. It took over an hour for the Thai fishermen to reel in the heavy catfish. Officials from Thailand's Inland Fishery Department wanted to use the female Mekong giant catfish for a breeding program, but she ended up dying. The people from the nearby villagers didn't let the fish go to waste and ended up eating it. 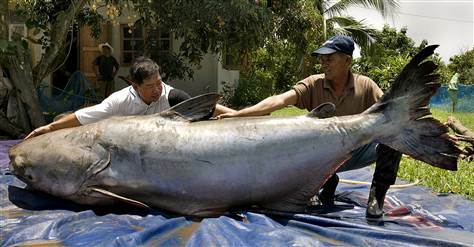 The Mekong giant catfish is rare and endangered and the one caught in 2005 was the largest ever caught since Thailand began keeping records in 1981.